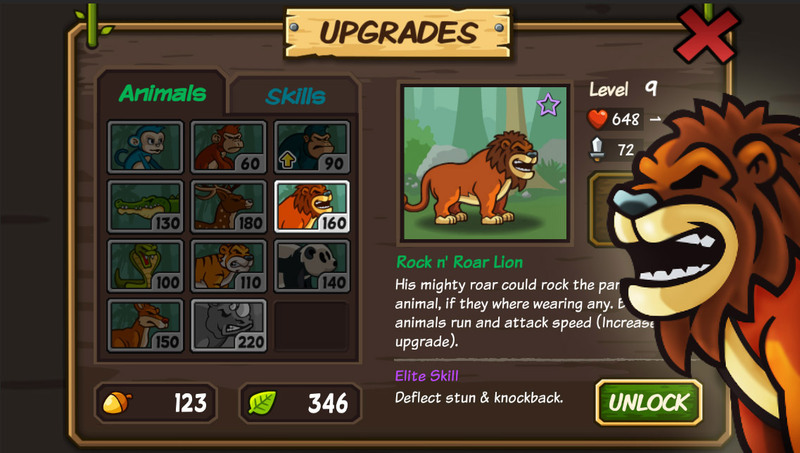 Which animal do you upgrade the most? 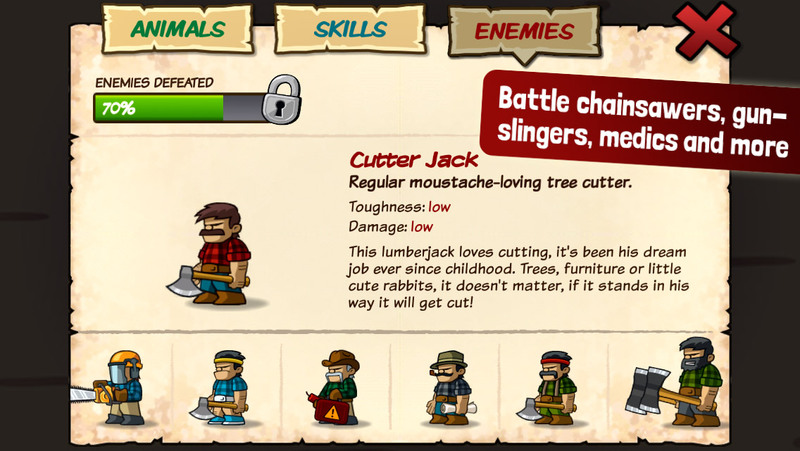 Please share which animal you upgrade the most in Lumberwhack, and why it is your favorite animal. Is it because it’s the most powerful one, or simply because it’s the most funny and cool looking? My own favorite is usually the Smashback Gorilla, who has both medium defense and attack strength. But perhaps yours is the Rock n’ Roar Lion or any of the other unique animals? 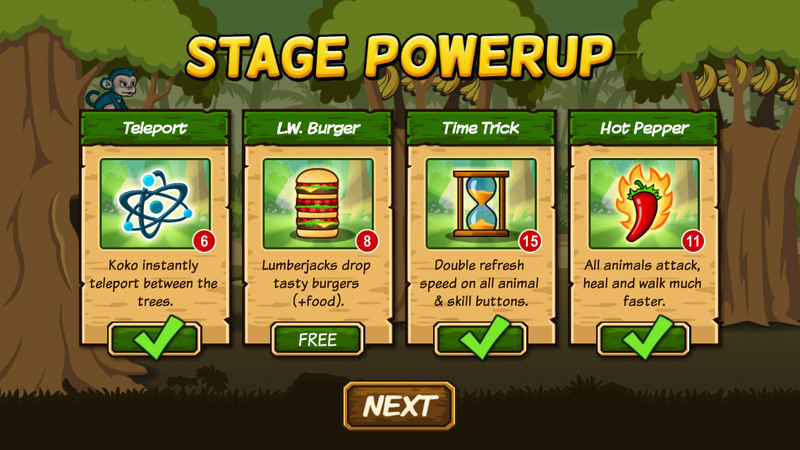 The upgrade animal and skill menu in the free mobile game Lumberwhack: Defend the Wild. Huge update for Lumberwhack is out! 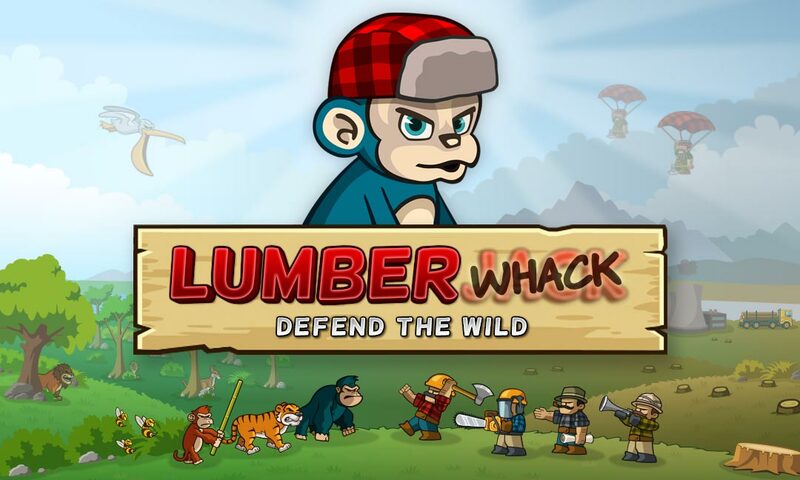 A very large update for the action-packed strategy game Lumberwhack has been released for both iOS and Android. It includes a lot of improvements that I hope will make the game more enjoyable for everyone. A summary of all the changes can be seen below. – New automatic collect food system, more focus on fighting. – New Gallery section, view all your animals, skills, enemies and game progress. – New Daily Bonus with rewards! – New In-game Achievements with rewards! – New visual fighting effects. – New Stage Bonus with lucky draw reward after each stage! – New and more detailed tutorial. – New Intro movie, staring Koko and the vicious lumberjacks. – New zoom & pan button, get a better overview of the battlefield. – The lumber truck at the end of each stage can now move closer and attack, destroy it to gain victory!. – Old Inventroy Items are now Power Ups or Consumable. – Enemies on Endless Mode now drop Power Ups, Consumable and Leafs. – You can now tap on dropped items to directly pick them up. – Improved all animals Epic Skills to be more useful and powerful. – Unlock Pathfinder to discover the location of rewards on the map. – You can now ask your Facebook friends for free Leafs! – Leafs can now be bought with Acorns. – Replaced Permanent Magnet with Teleport. – General difficulty and level balance. – Max animal and skill level increased. – Changed the location of animals & skills on the map for better team setup and game progress.